Before the start of this trip I had been working as an intern in Pasadena. Things were getting dull so I decided I would take advantage of the fact that the Whitney region is relatively close to the area. After obtaining a permit I headed up to Whitney Portal where I spent one night in the bed of my truck before hitting the trail the next day. The Meysan Lake Trail is readily accessible from the road, and the trail itself was pretty nice. Lots of switchbacks but the view of Lone Pine Peak was fantastic. Whenever I get back to the area I plan to climb that peak. After about 4 hours, 5 miles, and ~3600 ft of elevation gain I reached Meysan Lake and set up camp. The lake itself is beautiful and looks to have fantastic fishing if you decide to drag a pole up there. The nest morning as I was preparing to start out for LeConte I met an older gentleman by the name of Bob. 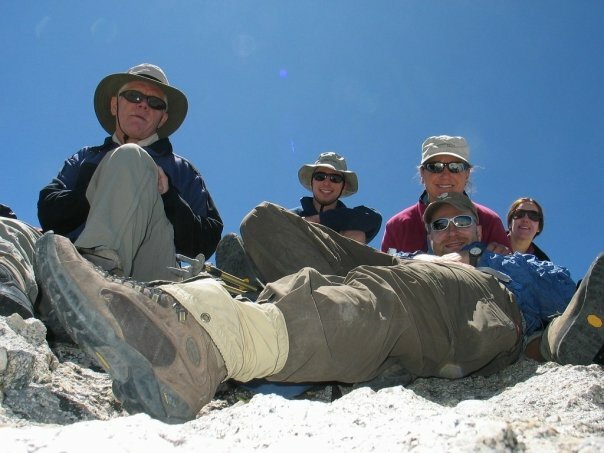 He had climbed Lone Pine Peak the day before and was getting ready to try for Irvine. He was an interesting fellow and we met again at the end of the day back at my camp. After a chat I started up for LeConte. I brought with me the descriptions from R.J. Secors "The High Sierra - Peaks, Passes, Trails." The main chute on East Slope was still covered with a thick layer of snow. Rather than attempt it without proper equipment I worked my way up around the right side of the chute. This seems to be a well trodden route and is almost all 2nd class with perhaps one or two 3rd class moves. After reaching the plateau between LeConte and Mallory I continued up towards the plaque at the base of the mountain. I took the Northwest Chute route and summited LeConte without any problems. The Waterfall Pitch was definitely the most difficult part but I didn't even realize I was on it until I reached the top and saw the anchors. Next up was the traverse to Mt. Corcoran. R.J. Secor mentions that this traverse requires good route finding skills... He is correct. I was very glad to have both his written description of the route as well as the photo of the route from Steve Eckert's trip report. I thought this traverse would take approximately 1 hour to complete as it is a very short distance between the two peaks. 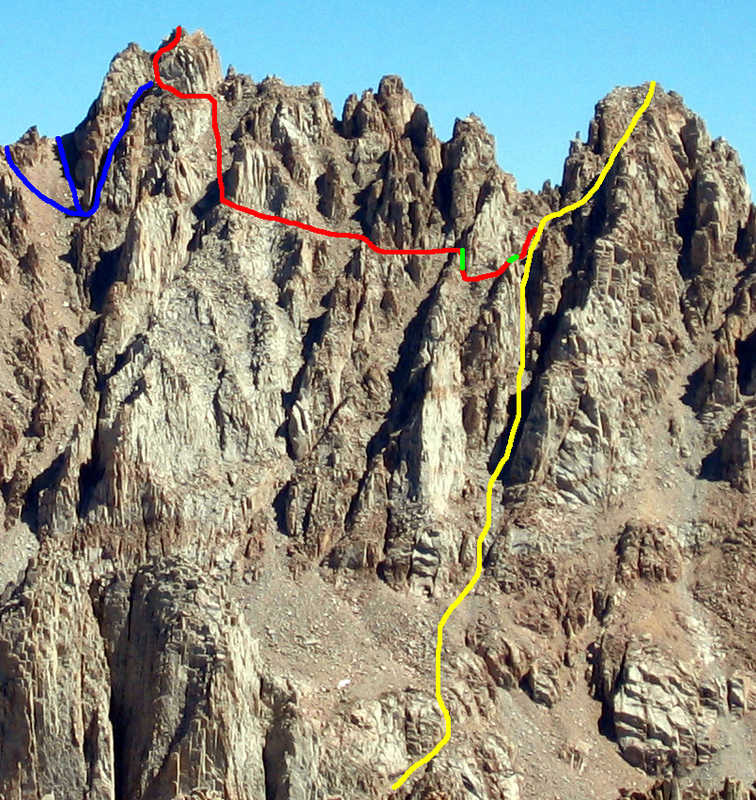 in reality the route finding took quite a bit more time and I summited Corcoran almost 2 hours after leaving LeConte. Leave yourself some extra time. I traversed back the way I had come and made slightly better time. When I reached the waterfall pitch I decided to use a cordelette I had brought with me to body rappel down (simply for the sake of safety and speed - I was wearing boots and was ready to get back to camp). I descended the East Slope the same way I went up and was back in camp before 5 pm. All in all about an 8 hour day. Back in camp I discovered a new group of climbers had arrived. I introduced myself and discussed with them some logistics for attempting Mallory, which we all planned to do the next day. The group included Lori Williams, Germar Bernhard, Anne Hoppe, and Chuck Banker. We all seemed to get on pretty well and decided to climb Mallory as a group the next morning. We left camp at approximately 8am for the East Chute on the far side of the lake. We all hiked at different paces but before long we were looking up at both Mallory and Irvine. We continued straight up (rather than moving south across one of the ridges of Mallory, as Secor suggests). There is a small notch between the northernmost part of Mallory and the next large feature along the ridgeline, and we passed through it. We found that there are several ways to summit Mallory from the northwest, and before long we were having snacks and taking pictures on the summit. After a while we split up as I wanted to climb Irvine and the other group had LeConte in their sights. I walked part of the way down the east ridge of Mallory before cutting across and descending into the basin between Irvine and Mallory. I have a feeling a cut across far sooner that Secor suggests as the route was quite steep. After reaching the basin it was a simple 2nd class walk up Irvine. At this point I was getting tired and it felt like a real slog, but there is nothing technical about climbing Irvine from this side. After reaching the summit I descended the East Chute and headed back to camp. It was another 8 hour day but overall a significantly easier one than the first. In camp I met another young man by the name of Jim, and we chatted while we waited for the other group to return to camp. There were some technical issues (2 members of that party descended the East Slope via the northernmost chute - a decision that caused them to spend an additional 3-4 hours on the descent) but everyone got back safe and sound and we enjoyed some wine and brandy with our dinners. The next morning (Sunday) we enjoyed a leisurely breakfast and eventually got around to packing up and hiking out. All in all this was a great trip made significantly better by the unexpected new friendships I formed.